We have sold over 100 WHB units around the world for the non-ferrous metallurgical industry. 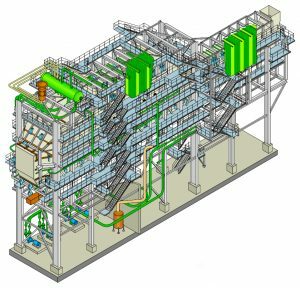 The design of our Waste Heat Boiler (WHB) is unique, designed to cool the hot process gases from the non-ferrous pyrometallurgical furnaces or similar processes. Heat is recovered for power generation for drying, heating, and other purposes. This recovery of the heat ultimately reduces fossil fuels consumption and its associated carbon emissions and environmental impact. These specialized boilers operate reliably in very challenging environments containing corrosive hot gases and molten ash particles.